I’ve had some extra time this week and have put it toward catching up on some cooking “to dos” that have been languishing on my list. Among them, the Daring Bakers’ cinnamon buns have been calling out my name, begging for first dibs. The Daring Bakers made cinnamon buns right before I joined and I regretted missing such a fun challenge. I’ve been known to get sucked in by the intoxicating aroma of cinnamon buns in many a Midwestern airport, and I figured it would be fun to be able to make such a winning treat from scratch. I thought I would offer this up as a great Christmas day breakfast treat. It turns out they are very simple to make – just a bit time-consuming as the dough needs to rise and then proof for several hours. But the actual active time is minimal and the dough is made easily with a dough hook in a stand mixer. 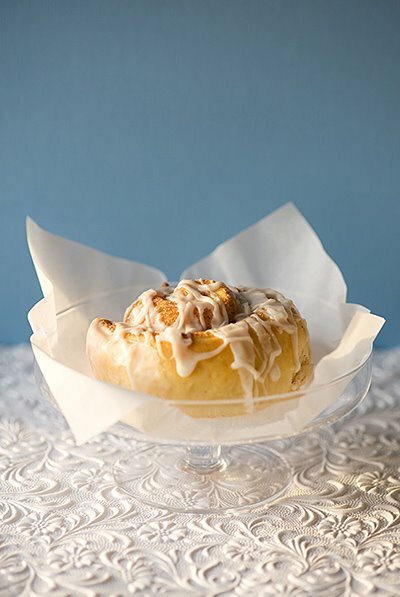 The buns can be made into cinnamon buns or sticky buns with a change of glaze and topping. The dough, in either case, is identical. There’s nothing more fun than watching the buns grow in size and squish together on the baking sheet, promising a sweet-tooth satisfying, decadent cinnamon experience that can only be delivered by a cinnamon bun! The recipe for both cinnamon and sticky buns can be found here, on Pip in the City's blog, the sponsor of the event. On another note, I wanted to let you know that I am experimenting with selling selected images on ImageKind. You can purchase both prints (framed or unframed) and greeting cards on the site. Both would make a nice belated holiday gift for a cooking enthusiast. Hop on over and have a look - let me know what you think. Those of you who have been following this blog know that it’s a rare occasion that I blog about red meat. It’s not that I don’t enjoy meat every once and a while, I just don’t eat it often enough to buy it and cook it at home. As a result, I'm not the world's most confident meat cook. 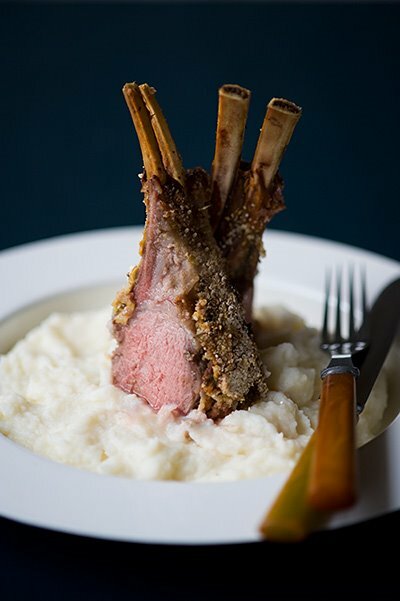 That said, there are a few reliable (and satisfying) meat dishes that I make over and over again when meat cravings take over: one of them is rack of lamb baked with a mustard-garlic-thyme-bread-crumb crust. The recipe is an old stand-by from Gourmet 1999 if you can believe it. It works equally well on beef tenderloin. It’s quite simple: essentially you slather on the mustard mixture and cook away. 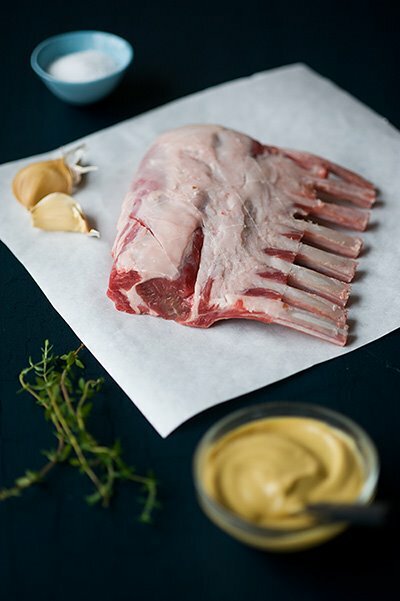 The mustard mellows out during the cooking process and the seasonings permeate the meat. When done you are left with delicious, flavorful meat coated with a satisfying crust. It is a great choice for dinner guests. A rack of lamb (or beef tenderloin) is unfussy, serves many, and is a crowd-pleaser (especially with a nice potato side). It also looks impressive, even though it's quite simple to prepare. Press bread crumbs onto mustard coating on lamb. Roast lamb until thermometer inserted into center registers 130 to 140 degrees F for medium rare or 140 to 150 degrees F for medium. Will take 30-45 minutes: check periodically. Garnish with thyme sprigs, if desired, and serve. Bringing you this flourless chocolate cake was a labor of love. I made this as one of two Thanksgiving desserts with the ulterior motive of photographing it and posting the recipe for you, but of course, I ran out of time and never photographed it. Determined to share this wonderful recipe, I made it again a few days later but I thought I’d second-guess the instructions and cook it for five minutes less. 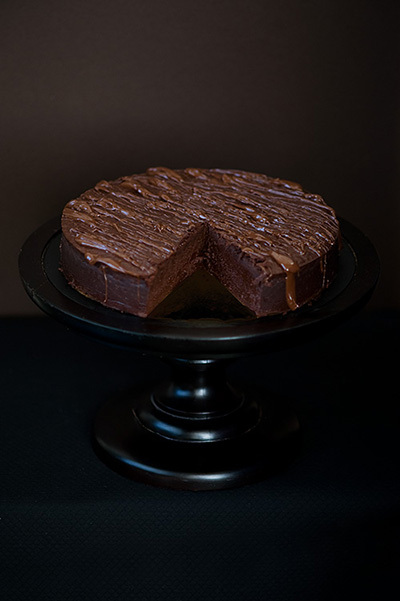 When I unmolded the cake from the springform pan, it spread out into a chocolaty puddle of $25 Valrhona – becoming un-photographable and teaching me a lesson: do not second-guess the recipe (note: it still tasted great!). A little annoyed but nevertheless still determined, I set off to make it again yesterday. This time I took my time and followed the tried and true recipe. It churned out the best version of the cake I have made yet: rich, dense and moist with a light crust on the top. It’s very sinful dessert, and one that looks more impressive than it is hard to make. Where did I find this gem? On Gourmet Girl’s (Louisiana-based Katia Mangham) great site. It takes a lot for me to get motivated to make something I read about. I read dozens of blogs and many cooking-related magazines and have a treasure trove of recipe books. With that much fodder for culinary creativity I need to really be impressed by a new recipe for it to actually get to the top of my “to try” list. Gourmet Girl’s site always gets me. She has wonderful, unusual original recipes that are sure to be crowd pleasers. I also tried her wonderful Torta di Risso - faboo. The only things I altered in the recipe were to remove the brandy, increase the quantity of vanilla extract to one tablespoon, and use semi-sweet chocolate for the garnish (I'm a monochromatic girl). See her original post here. 1. butter a 9" springform pan, line bottom with parchment and butter parchment. Wrap pan in aluminum foil and set aside. Preheat oven to 350 F. (Cookbook Catchall note: at this point, I fill my roasting pan half full of water and allow it to preheat in the oven so that the bain marie water mentioned in step 4 is hot by the time I put the cake into it). 2. Over a bain marie, melt chocolate and butter. whisk together until smooth, then set aside to cool for a bit. 3. In a mixer bowl, beat eggs and sugar until light and fluffy- about 10 minutes on high speed. Lower speed to low and gradually add chocolate mixture to eggs. Add brandy and vanilla, and mix until just incorporated. Remove bowl from mixer stand, with a rubber spatula lighlty fold batter just to be sure it's homogenized. (sometimes there is chocolate at the bottom of the bowl which has not mixed in). 4. Pour batter into springform, then place pan in a roasting pan. Fill roasting pan with hot water (I use the water use the already warm bain marie water), fill pan to half way up the saide of the springform pan. Carefully place in the oven and bake 45 minutes. Cool on a wire rack, unmold, drizzle white chocolate on top and serve with whipped cream and berries.